If so, it may not be a lack of interest of boredom but something important YOU as a parent can help with. 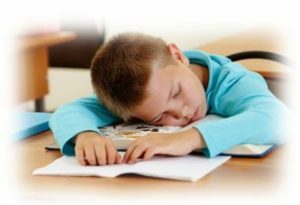 Here are some crucial facts about SCHOOL AGE SCREENING FOR SLEEP PROBLEMS IN YOUTH. Obstructive: Large adenoids / tonsils or tongue displaced back into an airway. Environmental: Allergies or chronic sinusitis. Anatomic/structural: Misaligned jaws or airway dysplasia. Mouth breathing, loud snoring, tossing and turning, gasping and choking during sleep. Attention difficulties, unpredictable behavior, mood disorders at school, even depression can be caused by a lack of restful sleep. Bed-wetting, sleep-walking, diminished growth, hormonal problems, metabolic problems and narrow dental arch problems are common. Obstructive sleep apnea increases the risk of heart disease, stroke and diabetes. Insufficient sleep in the youngster’s formative years is associated with metabolic, cognitive and emotional behavioral effects. Pediatric sleep-disordered breathing is a growing area of interest and kids can fall through the diagnostic cracks when this is not recognized and managed. 25% of ADHD problems are children deprived of restful sleep and thus behavioral problems. Sleep-disordered breathing in the first five years of life is associated with 40 – 60% greater chance of special educational needs by age 8. The American Association of Pediatrics “Practice Parameters” recently stated that all children should be screened for snoring because of the 70% overlap of snoring and sleep apnea. The numbers are staggering. Sleep-disordered breathing is under diagnosed, and often clinicians take a wait and see approach. Invasive interventions are needed to correct the problem later. Your child suffers lessened quality of life, behavioral and/or learning challenges unless helped to restore normal breathing and sleep. A simple questionnaire and selective 3-D images of a child’s airway helps identify restrictions. Facial orthopedics can help to open the airway, with teamwork by medical and dental sleep specialists for related treatments to optimize the airway and sleep quality. Patients may benefit from a home sleep study, or see an Ear/Nose/Throat (ENT) doctor if tonsils or adenoids need to be removed. Simple allergy medications may work for some. A common approach may be simple upper jaw orthopedic expansion to correct a narrow jaw, or lower jaw lengthening with widening of the dental arches. Within weeks / months the child typically rests better and awakens normally. Studies show a strong association between pediatric sleep disorders and childhood obesity. Weight management, oral appliances, or positive airway pressure therapy are very effective treatments. Bruxism (teeth grinding) occurs during restless sleep and causes primary teeth to become worn – a direct connection with sleep-disordered breathing. Also, sleep-deprived kids may have a lisp caused by inadequate tongue space and poor teeth alignment, chronic dark circles under the eyes, difficulty waking up in the morning, irritability, fidgety behavior, mouth breathing and recurrent episodes of nasal congestion. Clinicians and parents can do harm by doing nothing. The key factors are recognizing and preventing airway problems and breathing conditions when your child is young. Everyone feels, performs and behaves our best when well rested. Contact Jupiter Orthodontics for simple screening and proper guidelines for your child.